Haes have recently introduced these new and innovative fire extinguishant control panels to the market. 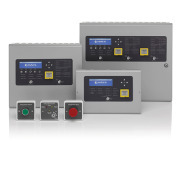 With the ability to release an extinguishant gas to single or dual flooding areas, these control panels are fully configurable to control automatic extinguishant release in multiple scenarios within different industries and businesses. The Esprit control panels are designed from the ground up to be intuitive and flexible for the engineer. The large graphical display accommodates an easy-to-navigate menu system with simple discernible icons in each section. Adequate sounder circuits are provided for stage 1 & 2 alarms and support for both metron and solenoid type actuators is provided as standard. With Flexible zone voting for the gas release and programmable countdown timers to suit the exact requirements of the site, the in-built safety features ensure the clients employees and assets are protected to the highest degree with the minimum risk.